PowerPoint, the number one presentation software, has been revised and improved with the introduction of Microsoft Office 2010. More than 120 million people are using PowerPoint to create business and educational presentations worldwide. 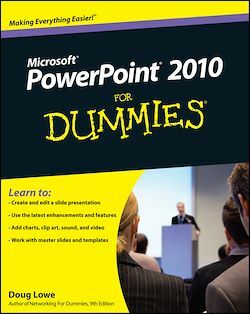 Both new and veteran PowerPoint users will improve their skills with the fun and friendly advice in PowerPoint 2010 For Dummies. Bestselling author Doug Lowe makes it easy to grasp the new features and shows you how to create presentations with pizzazz. PowerPoint 2010 For Dummies helps you take full advantage of the enhancements in the new version, so you can create more effective and impressive presentations.